The Bulls finished off their trip to Ohio with a bang, three home runs (Arencibia, Motter, and Shaffer), and a fine pitching effort by Scott Diamond. Their travels and travails these last couple of weeks may not be over as more roster moves have happened and likely more are coming. We have to admire the skills of Jared Sandberg even keeping a halfway decent team on the field during this period. And we have to admire the players whose every day starts and ends with uncertainty about their future. You have to think that their only thought is just to get out between the lines and play some baseball. Nice to see Luke Maile back in the lineup yesterday. He’d been missing for a couple of days. The Bulls will play Norfolk in Norfolk for two games, then come to Durham for a couple of games. 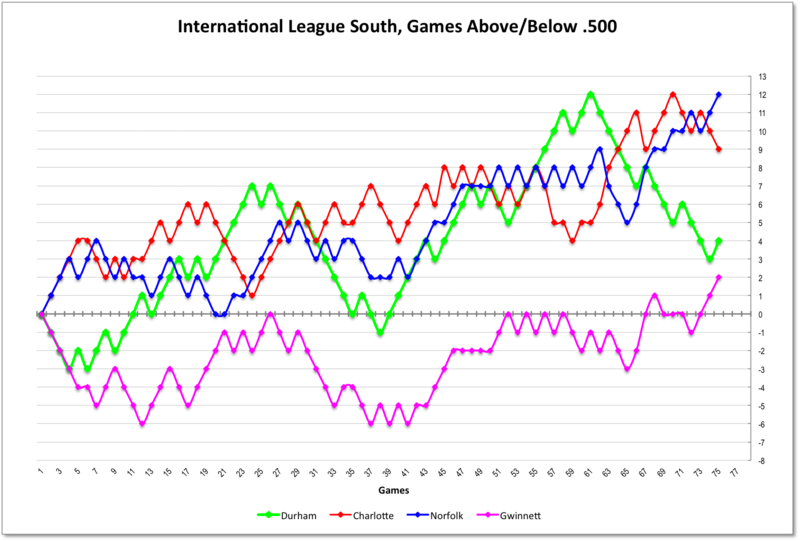 Norfolk is now in the lead in the International League South Division. Their run up pretty much matches the Bulls’ fall over the same time period. 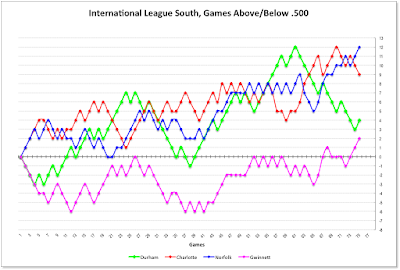 See chart below for a picture of this season. First Baseman Marc Krause to Durham. Marc Krause played 4 games and got one hit for the Rays before getting sent to the Bulls . As a first baseman, he’s going to find a crowd over in that corner of the field — Shaffer, Arencibia, Belnome (and the recently departed Alan Dykstra) — unless the Rays make some room. July seems to be the month for dumping folks as the Rays invalid list seems to be improving. Stats. Ronald Belisario who did so well for the Bulls this year, has been DFA’d by the Rays. Will he end up back with the Bulls? Who knows.